I have an appreciation for the Rosary, but I’ve never gotten giddy over praying it. I always knew it was important, but it wasn’t until this year that I have looked forward to praying it. There’s something about dropping off my tiny bundles of energy in the nursery and gathering with other moms for some prayer and sharing every Wednesday that makes the rosary so much more appealing! Peace, quiet, prayer, meditation. Ahhhh. The other week at my mom’s group while we were praying the sorrowful mysteries, the meditation on the crown of thorns hit me in a new way. 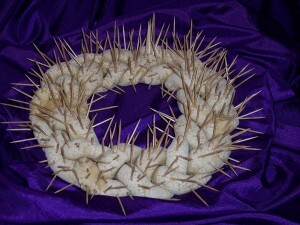 In recent weeks we had talked about ways to bring our kids into the Lenten season, including the toothpick crown of thorns for sacrifices leading up to Holy Week. So my first image as we started the third decade was Jesus wearing that toothpick crown, but as we were praying, I was wearing the crown and realized Jesus was telling me something about my motherhood. I kept thinking about the humility Jesus had to wear that spiked crown, knowing all the while that He is the King of Heaven, yet quietly submitting to the pain and injustice of it all. I started to realize that I have almost zero of that humility that Jesus had in wearing his crown of thorns. I don’t allow injustices. I correct them, even (especially!) with my husband and children. I want to appear to have it together in front of other people. Who doesn’t want to seem like an amazing parent? Who doesn’t want to other people to respect and admire them? Well, Jesus. So it’s making me think: Am I, like Jesus’ acceptance of the crown of thorns, quietly submitting to the will of God or am I trying to have other people congratulate me on what a great job I’m doing? Am I writing this blog to get other people to like it, or am I writing because God has given me insights to share? Am I posting things on Facebook or sharing with other moms because I want to wear the glorious crown of appearing like a good mom, or am I like Mary who quietly and humbly kept all things in her heart? As Lent approaches, I want to spend more time meditating on the crown of thorns and how I can grow in humility. 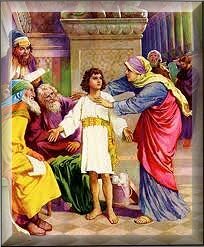 What kind of mortification is it going to take to help me to be more like Jesus? How can I humbly accept the pains and sacrifices of raising children without kicking and screaming along the way? 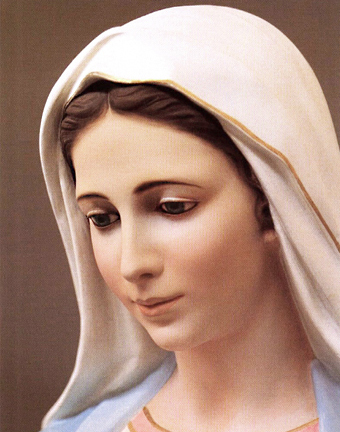 How can my motherhood be more of the simple and humble way of Mary? Lord, show me what my crown of thorns needs to be this Lent so I can grow in humility and become more like you.